Are you bored with the bad weather? Fancy trying a spell to make the sun shine? Here is some folk magic I was taught by a friend many years ago that is intended to part the grey clouds and help the sun show its face. 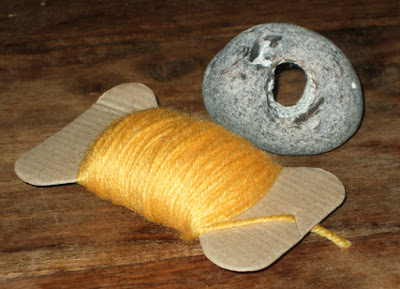 All you need is a stone with a hole - sometimes called a hag stone - and a length of yellow wool. Tie one end of the wool through the hole. 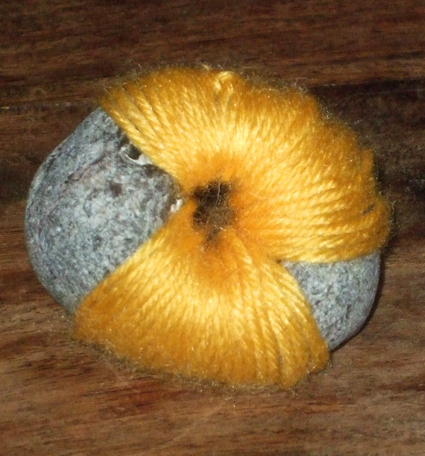 Then wrap it around the stone, threading it through the hole and around the edges. 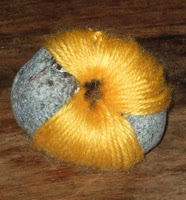 Continue around the stone, wrapping it with wool so you get something like the stone in the photo to the right (although you might be able to do it more evenly than I did). As you go, visualise grey clouds being dispelled and the sun shining in blue skies. As with most real-life spells, you won't get an instantaneous result. However, with a bit of luck, you could see an improvement in the weather over the course of the day.